Mycobacteriosis is a disease caused by several bacterial species within the genus Mycobacterium. Some of these bacteria can cause serious diseases in humans. The species that cause Mycobacteriosis in fish are referred to as non-tuberculous bacteria. They do not tend to cause major disease in normal and healthy people. Non-tuberculous mycobacteria are fairly common bacteria found in the environment. This means you do not have to have fish or other living tissue for them to survive. They have been found in drinking water supplies, swimming pools, coastal waters, and aquatic facilities. Mycobacteriosis is of concern in fish for several reasons. First, it slowly destroys the fish as it causes a chronic wasting condition. It should be suspected when fish are in poor condition but also have scale loss, skin ulcers, or a history of reproductive problems. At times you will see deep hemorrhagic skin lesions in addition to the more common superficial lesions. The mortility level is continuous low to moderate within the affected population. This can result in significant loss of fish. The second reason is the disease is considered non-treatable once established in the fish host. Unfortunately, Mycobacterial diseases of fish are common. Though some species seem to be at greater risk than others, all fish are susceptible. The disease has been found in a broad range of fish and from freshwater to marine. Fish in the families Anabantidae (bettas and gouramis), Characidae (tetras), Cyprinidae (barbs, danios, koi and goldfish), and some members of the Cichlidae (including freshwater angelfish) may be more prone to the infection. This disease is also of concern in recirculating systems and once established can be difficult to eradicate. High organic loads, water quality characteristics common in intensive systems, and very crowded populations can all exacerbate the infection. And if that is not enough, Mycobacterium infected fish do have the potential to cause disease in humans. Mycobacterial infections of fish are zoonotic, which means the organisms can cause disease in humans. Considering how prevelant the organisms are, these infections are relatively rare. Infections in people are usually associated with cleaning aquaria or from and injury resulting from contact with fish. The most common symptom in human patients is skin lesions that develop on the hands or extremities where broken skin may have come into contact with infective material. These lesions are often called “fish tank granuloma” or “fish handler’s disease.” Lesions in humans may develop from 3 weeks to 9 months after contact with infective material. Typically, mycobacterial lesions in humans are restricted to the extremities, particularly the skin though deep lesions into musculature and tendons have been reported. Rarely, systemic disease has occurred in immunocompromised individuals. Mycobacteria thrive under certain environmental conditions. They like warm water temperatures, low dissolved oxygen levels, acidic pH, high soluble zinc, high fulvic acid, and high humic acid. Investigators have found a much higher prevalence of mycobacteria in swamps as they have the desired environmental conditions of low levels of dissolved oxygen, low pH, high organic loads and warm water. Another investigation found a high amount of non-tuberculous mycobacteria associated with low salinity. All these conditions can be easily found in freshwater aquaculture systems. Trace amounts of certain minerals, particularly zinc and iron, have also been associated with greater numbers of mycobacteria in an environment. In addition to being present in infected fish, mycobacterial organisms also live in filter media and biofilms. Mycobacteriosis is a progressive disease that may exist for some time before it is noticeable. Younger fish infected with mycobacteriosis often show no external signs because of how slow the disease progresses. The infection becomes more serious as fish age or become stressed. Once the bacteria become noticeable it can take on many forms and be difficult to diagnose. Affected fish may become listless and lethargic.They may also refuse to eat becoming emaciated. Fish may also become sluggish and bloated presenting a “dropsy-like” condition with extreme abdominal distention and fluid accumulation. The bloating has been reported in fish infected with M. fortuitum. The skin is often affected. Currently we are seeing the species M. Triplex in many fish. These fish have lesions that resemble columnaris and are usually located around the head. 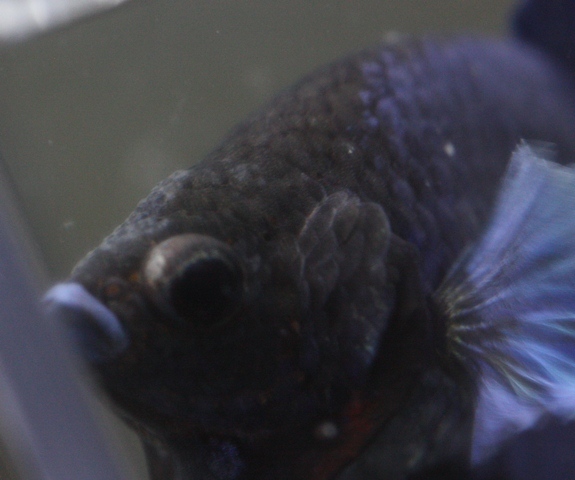 Notice the grey areas on the face ad gills of this blue betta. Some fishes may have skin ulcerations in the muscle that rupture the skin to the outside. Others may have pigment alterations, being brighter in color or duller. Other fish will develop fin and tail rot as well as scale loss. If infection spreads to the skeletal system, the bacteria may cause deformities such as a bent or curved spine. Fish may also be stunted and small. Small fish are often found in systems protected from natural predators. Some affected fish may not develop sexually and lack secondary sexual characteristics. A bulging of the eye or eyes is also a fairly typical feature. Internally the fish develop gray-white granulomas (nodules) in the liver, kidney, spleen, heart, and muscles. When the nodules develop in the organs, edema (excess fluid accumulation) may develop, as well as inflammation of the body cavity. Mycobacteriosis is a systemic disease that can affect virtually any organ system. (Noga et al.,1990).Eventually, infected fish succumb to the disease and die. If the fish have a history of progressive loss of condition, they do not respond to antimicrobial therapies and there are skin lesion, one can begin to look at Mycobacterium spp as suspect. The disease can show itself in so many different ways there is no typical presentation. Reproductive problems are often part of the history. Increased fish deaths and reproductive problems are often the first indicators that leads one to a diagnostic investigation of the fish. Though granulomas or lesions are classic with mycobacteriosis, they do not always develop. To make matter worse, Mycobacteria spp. have been isolated in tissue of a clinically normal fishthat shows no obvious disease or pathology. Currently, there are no non-lethal tests to determine if fish have mycobacterial diseases. That means the only way to know for sure, is to submit them to a lab to get conformation. Once the Mycobacterium is found there are still more tests needed to determine the species of bacteria affecting the fish. If you have having multiple symptoms and they will not go away, it is wise to assume your fish have the mycobacteria and take appropriate action to reduce your losses and eradicate if from your fish room. Mycobacterial infections of any fish should be considered non-treatable. There are some research reports of aquarium fish responding to antibiotic therapy, but individual fish have not been cured of the disease. Symptoms may temporarily disappear but they often reappear when antibiotics are discontinued. And again, the antibiotics do not eliminate the disease. Once a population of fish is infected, the organism is magnified, creating a vicious cycle of infection, disease and death. Since there is no effective treatment for infected fish, disease prevention with the use of quarantine and disinfection protocols is vitally important. Infected fish release the organism from skin and gill lesions and shed them from the gastrointestinal tract. Bacteria are also released from internal organs when sick fish die and decompose. Infection can be spread when fish have direct contact with infective material or ingest infected tissue. In addition to fish to fish or horizontal transmission, vertical transmission meaning mother to offspring, also occurs. Less well known in egg laying species the vertical transmission is well documented in live-bearing fish. Until more research is done, and information is available, one should assume vertical transmission is possible and act accordingly. Infected broodstock will infect their young. It makes little sense to produce infected fish, as fish from infected parents will likely be stunted, have chronic mortality, pose a risk to other fish and those handling them. Any tank or system where fish were housed, that becomes infected, should be depopulated and completely disinfected with appropriate agents. Although one can take steps to decrease the severity of infection in a group of fish, the disease cannot be reasonably treated and cannot be cured. There are no FDA-approved treatments for mycobacteriosis in fish, nor are there any unapproved products that are effective. Depopulation of mycobacterium-infected broodstock is recommended. Fish populations that carry the infection need to be euthanized. Otherwise infected fish will be a constant source of infection to other fish and those that handle them. Maintaining a population of mycobacterium-positive fish makes little sense. There are many options for euthanizing fish. The important point is that animals are killed quickly and in a way that minimizes discomfort and distress. For a serious breeder that has several generations of work invested in infected fish, there is a possible other option. If the fish will actually breed, you can get the off spring and raise them very separate from other fish. Once the spawn is doing well it is advisable to destroy the parents. Bear in mind these fry are probably infected from their parents so watch for stunted growth and bent top lines as they grow. Constantly look for signs of the disease in this bunch. Make sure any nets, hoses and such are completely disinfected after each use. Destroy any fish that shows signs of mycos as soon as it is detected to keep the bacteria from gaining ground. 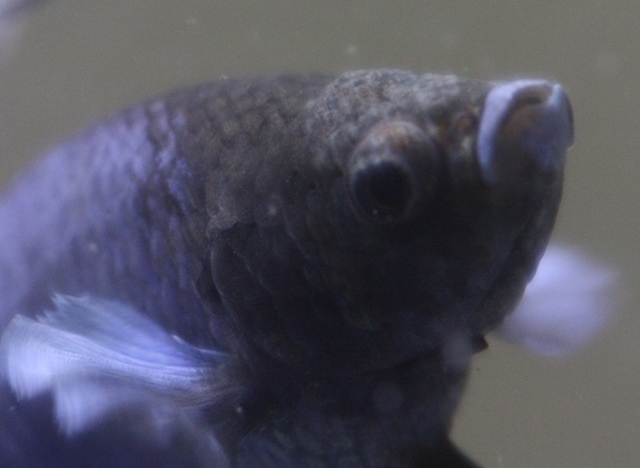 I would work your “clean” fish first then feed and clean the potentially infected offspring. Be very careful if you have other fish and systems that are clean not to cross contaminate. As this batch of fry grow, breed the best at the earliest opportunity. Fish can be bred anywhere from 8-12 weeks of age. Remember, they came from infected parents and are probably carrying the disease. What you are trying to do is get a spawn before the disease takes hold of the fish and the egg and sperm are affected by the bacteria. You also want to avoid having it enter the water column. Do not use as breeders any fish showing signs of the disease as it will be shed in the water. And I would not allow a spawn attempt to go for long as the feces can also be introducing the bacteria to your sterile spawn tank, exposing the fry as they grow. If you get nothing after 3 days, break it down and completely sterilize it before setting it up again. Use a turkey baster and keep feces out of the tank. Do not forget to sterilize the baster. Yes this will all be a pain, and you may have to compromise on you choice of breeders, but it is a way to keep a line going if you do not want to completely destroy it. Again watch for the development of the mycos in the F2 generation. Poor growth and bumpy top lines are a sign you still have it. Once you get a good F2 going it is wise to destroy all of F1. They came from infected parents and you increase your risk of not getting rid of the disease. Ideally that F2 generation will be clean. Use good biosecurity in your fish room, as you must proceed as if you still have the active bacteria until your fish prove clean. If all goes well you now have Mycobacteria fee fish and the line preserved. If you decide to do the F1 cross with only one fish that is infected, you may increase your chance of success. But you must remember this fish will now be exposed to the disease and should not be put back in contact with any other fish. There is a high probability this fish will develop the disease and succumb to it. So only do the breeding aware of the risks to the clean fish used. Cleaning a system that is known to be infected with mycobacterium requires extra effort. To completely eliminate mycobacteria from a system it must be depopulated and completely broken down to its component parts. All filter media and disposable materials should be discarded, including plastic tanks. The system should be thoroughly cleaned with bleach to remove and break down organic material and the biofilm that may harbor organisms inside pipes and in other inaccessible areas. Then it is essential to treat all surfaces in the system with a mycobacteriocidal agent. Mycobacterial organisms are more resistant to disinfection protocols than most any bacteria encountered in aquatic settings. A waxy coating in the cell wall of mycobacteria gives them extra protection from many common disinfectants, including bleach. Effective mycobacteriocidal agents include Lysol® (1% benzyl-4-chlorophenol-2-phenylphenol), sodium chlorite, and ethyl alcohol at 50 or 70 percent concentrations, but not 30 percent (which requires at least 10 minutes of contact time). Chlorine bleach (sodium hypochlorite), even at concentrations as high as 50,000 mg/L, is only moderately effective in reducing the number of mycobacterial agents in the environment. Roccal® and Virkon®-S are ineffective. Please note the Lysol® is not the common household cleaner but a hospital strength one. Other products that will kill the mycobacteria are listed HERE. You may talk to your local vet and explain what you are dealing with and see if he can get you a product that will work. Whatever product you use it must be used on everything. Nets, tanks, hoses and what ever else you may use in the fish room. Think water test kit tubes, eye droppers and the drain you run your water changes through. Most any product will require a certain amount of contact time to be effective. Don’t take any short cuts. Since these products will also kill fish you will want to rinse the items well with water. Then come back with a strong bleach solution over the entire surface. The bleach solution can be rinsed well and the items used. If you have concern about the bleach, a soak in any water conditioner will remove the bleach. Preventing disease is always more cost-effective and rewarding than treating it. This is especially true in the case of mycobacterium, as no vaccine or satisfactory treatment is available.Having to destroy your fish and start over is not fun. So take steps to keep this and other diseases out of your fish room. Biosecurity in aquaculture means that aquatic organisms are protected from the introduction of new diseases. One of the basic tenets of biosecurity is avoiding the introduction of sick animals in the first place. This is accomplished by controlling the source of new animals before introducing them to established groups, and quarantining new animals upon arrival. Fish should be purchased only from trusted sources. New fish should be quarantined from established populations for at least 30 days. Even then it may not be wise to add them to any closed system. Going forward you want to be careful about not getting this or anything else your fish room, so develop a habit of disinfecting everything before use on another tank or fish. Use one net per fish and thoroughly disinfect everything before moving on to another tank, including your hands. This is a good article on Bio-security in Aquaculture. As you can see, a diagnosis of Mycobacteria in a fish room can be heartbreaking. Take steps to prevent it, and if by chance you get it, it CAN be eradicated and you can move past it. And if you are one that likes to rescue sick fish from local pet shops, you may want to carefully consider what you are exposing yourself to the possibility of. Ask any one that has had to destroy fish and go through the thorough cleaning of their tanks, and they will tell you not one fish is worth the exposure. I will be adding a photo library so you can identify this in your fish room. I have many links that I have saved and will be going through them and adding the links here. Going forward I will continue to add links to any articles I find relevant to this disease. Molecular systematics support the revival of Mycobacterium salmoniphilum – bottom of the page click for full article.